A good climbing competition has to have some essential ingredients. Firstly you need talent in the form of some of the best climbers in the world. Then you need some intriguing, insane structures for them to try and climb. Add to this a large crowd of spectators who understand whats going on, are psyched up and baying for action (and who've enjoyed themselves in the beer tent)! Then throw in some loud music, sketchy commentary and some bright lights. Then you need the last essential ingredient, and the hardest one to find. You can't buy it, and you can't plan for it, but now and again you get it just at the right time. The last ingredient is luck. When it all comes together, you create a magical sporting moment - “ the World Cup in Leeds 1989 when Jerry Moffatt won, the World Cup in Birmingham 2005 when Mark Croxall won - all amazing moments in British competition climbing. This years Climbing Works International Festival (CWIF) was another of those magical events where everything came together in the right place at the right time. The CWIF is now in its third year (previously rather amusingy being called the Climbing Works International Masters, or CWIM or short!) and this year the event got a spot on the IFSC international competition calendar to attract a few more foreign climbers. 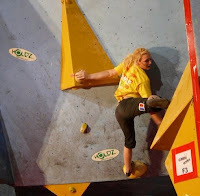 This coupled with the fact that even in these hard financial times, the Climbing Works injected over £10,000 into funding the event and the prize money ensured a premier league field of climbers at the event. The event format is simple - if you win you get a load of money, so in order to win you have to do one of the hardest days climbing you'll maybe ever do! The mornings open qualification session was an informal affair - 5 hours to complete a circuit of 30 boulder problems varying in difficulty from Font 4 to Font 7c, and in every style imaginable. Desperate slabs, all-out dynos, brutal power, bizarre balancey volume wrestling - you get the idea. In order to get a good score you needed to be good at everything! Oh, and have a load of stamina. Over 200 climbers took part in the mornings session, with people coming from all over to take part. This years CWIF attracted climbers from France, Spain, Holland, Belgium, Poland, Slovakia, Australia, and even Newcastle Upon Tyne(! ), making the CWIF the only true international competition that will be held in the UK this year. At the end of the qualification period there were a lot of very tired people, but the best 16 men and women were selected to take part in the afternoons semi-final. 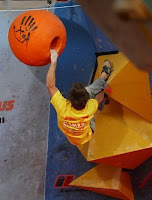 The semi-finals were brutal, designed to select only the top 5 climbers in each category, so the list of people who didn't make the cut spoke volumes -current British champion Ned Fehally, ex british Champions Gaz Parry and Andy Earl, Diane Merrick, Joackym Ramsamy - all great competition climbers, but they just couldn't keep going to make the cut for the final. So, the finals. Whilst the finals problems were set, the crowd enjoyed a free barbecue and a Niall Grimes, before heading back to the competition wall for what was to turn out to be one of the most electrifying finals I can remember in recent years. In both categories there were 5 climbers to attempt 3 problems of the utmost complexity and difficulty. A brief word should be said about why this comp was so good. Now I know its bigging myself up a bit, but the route setting is a key thing that makes a competition successful or a failure. The Climbing Works boys know this, so they selected a route-setting 'dream team' to create the problems for the CWIF, including masters of the art like Jacky Godoffe (Fontainebleau), Jamie Cassidy (Liverpool), Andy Long (Portland), Jason Pickles (Todmorden), Tonde Katiyo (Paris) and me (Sheffield). The beauty of employing such a large and experienced route-setting team means that the problems end up being a hugely diverse set of styles, yet all being fantastic to climb. This diversity was exemplified by the problems for the semi's and finals for this event. The womens final ran simultaneously with the mens which meant that at some points it was hard to know which way to look as there was so much happening! After the first couple of problems last years winner, Vera Zilstra (Hol) started to show signs of how tired she was, whilst Maud Ansade (Fra) and the Climbing Works very own mild-mannered receptionist, Leah Crane were still in offing for the top spot, so it was all down to the last problem. Maud was first out on the third problem, a huge jump from a side wall onto a big slopey boss on the lip of a roof. After a number of initial tries to stick the first jump she latched the hold and battled her way to the top to the encouragement of a roaring crowd. Climbing last, Leah had to climb the problem within 3 tries to win, and the pressure was on. She didn'y disappoint, climbing to the top on her first try, but then calamity! With one hand on the finishing hold (a nasty sloper) all she had to do was get her other hand onto the same hold to match for the win, and that's where the trouble started. Try as she might, Leah just couldn't get into balance to match the hold for the win, and no matter how much the crowd screamed encouragement or she fought to find a solution to the last move, all was in vain and she eventually slipped off. The remaining couple of minutes were amazing as Leah fought to regain her highpoint, but alas, it was not to be and eventually she had to settle for second place, with Maud winning the event. As if the womens competition wasn't exciting enough, the mens final proved just as scintilating to watch. Again, after the first two problems the battle for first prize was down to a straight fight between multiple World Cup winner and current European champion Jerome Meyer (Fra) and Manchesters finest - the pocket rocket himself, Dave Barrans. Both guys were destroyed after the battle with the twisted wierdness that was the second problem - a masterclass in upsidedown compression courtesy of Monsiuer Godoffe, but the crunch problem was number 3, more huge compression moves up a 50 degree prow, a wild spinnng dyno for a strange blob-like fang, then two of the worst holds you've ever seen to gain the top. First out was Jerome, showing the control and composure only a competition of this class can, and after a few failed attempts, he finally got established on the head-wall only to fall with one hand on the finishing hold! Last man out, all Dave Barrans had to do was complete the problem to win. The crowd were going balistic by this point, they knew the score and if the sheer volume of their support provided the outcome of a competition, Dave would have won by miles! However, in the end, Dave just couldn't find that last bit of power to finish the problem off, leaving top spot for Jerome Meyer. The prizes were awarded by Mr Reindert Lenslink - the General Secretary of the IFSC (International Federation of Sport Climbing) - and the party continued on well into the night at a number of Sheffield venues! Big thanks must go to the companies who supported the CWIF at a time when most climbing companies are trying to spend as little money as possible, so a mention must go to Holdz, Metolius, Five Finger Thing and The Clinic for sponsoring the event.